AFTER keen competition, four teams (from the 19 participating formations) Traffic HQ, Traffic HKI, MODIST and CDIST made it through to the Luscombe-Leslie Cup basketball semi-finals with Traffic HQ going up against their kinsmen from Traffic HKI in the finals played at the PSRC on 8 May. In the end, the youth and energy of Traffic HKI was no match for the wily experience of their older brothers from Traffic HQ who took the championship 75-54 with CSP Traffic, Lai Pak-hay, ending the exciting tournament with a slam-dunk 2-pointer in the last seconds. Cup going to SSP Kenny Ip Lau-chuen who beat Sergeant Yuen Chun-kwong 3-1; while the Chairman's Cup went to Auxy PC Connal Chan Tak-kay who defeated fellow Auxy PC Philip Ko 3-2 in the finals. 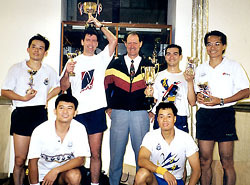 The main competition was a repeat of last year's final between the top two players CIP Peter Barnes and PC Yau Wing-wah, with CIP Barnes keeping the trophy for another year in a 3-0 victory. At its annual meeting after the finals, Most Improved Player and Player of the Year were awarded to PC William Siu Chak-man and Tam Yip-shing respectively. 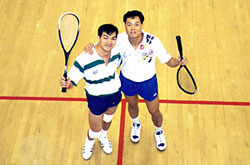 The plate finals of the main competition between Sergeant Jimmy Lau and SIP Guy Walkedon was adjourned because Sergeant Lau was unable to attend due to duty commitment. 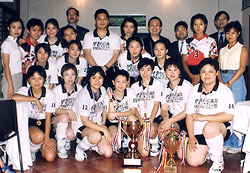 THE Police Ladies Volleyball Team recently took the coveted Felicia Cup (named after Felicia Wong Leung Kam-shan, WACP) by defeating teams from Hong Kong University of Science and Technology, Hong Kong Baptist University, Hong Kong Polytechnic University and City University of Hong Kong. Final score (games won): HK Police Ladies Volleyball Club: 6, HKBU: 5, HK City U: 4, HKPU: 4 & HKUST:1. The Felicia Cup is the first match of the season to be followed by the District league games, the Macau Interport, the Guangdong Interport - and an overseas tour to Tokyo in September. All interested police women are welcome to join the club's Thursday evening practices from 6pm to 10pm at the PSRC. Queries: Chung Tak-keung: 8103-3979. TONY Ho Tse-tong, Tsuen Wan District Commander, together with the enthusiastic support of a group of like-minded colleagues, actively promotes a healthy lifestyle programme of activities for officers of all ranks, including civilian staff and their family members working in Tsuen Wan District. The programme encourages voluntray participation in worthwhile off duty activities in order to reduce stress and promote positive values. Mr Ho emphasied that these activities should be held outside of duty hours, with the ultimate goal being for officers to organise their own activities allowing the concept of a healthy lifestyle to become a "norm" - a way of life. "A small number of officers might participate in these activties merely to show support for their senior officers, to get away from office duties or because they are free of charge," admits the District Commander, "but this type of attitude must be corrected and officers helped to understand the real benefits received from living a healthy lifestyle." To Mr Ho, the concept of a healthy lifestyle can be broad: " A married officer told me he couldn't participate in worthwhile pastimes when off duty because he spent most of his spare time looking after his children and helping his wife with housework. I told him that was a healthy lifestyle and I hoped he'd continue and perhaps influence other colleagues to be likewise." In order to develop a healthy lifestyle programme, a survey of officers' interests in the District was conducted. 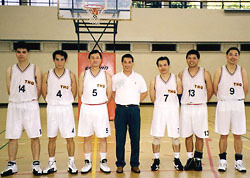 Based on its results, different activity groups were formed for swimming, fishing, badminton, volleyball, hiking, xi kung and language learning as well as Potential Officer study group. 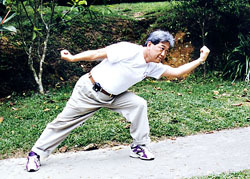 Mr Ho emphasised that these activities should be held outside of duty hours, with the ultimate goal being for officers to organise their own activites allowing the concept of a healthy liftstyle to become a "norm" --- a way of lift. Officers from Lei Muk Shue Division took the initiative to organise a basketball team and strengthened community relations by inviting students from several secondary schools in the area to play. District Commander Ho: "To ensure spare time is spent positively and to ensure ways in which one manages stress are productives should convey and promote a healthy lifestyle message and encourage all officers to make such activities second nature. "As police,we are entrusted by the community we serve with the responsibility of upholding and enforcing the rule of law. In order to do this, every office must be of good character and set a proper example by obeying the law and living a healthy lifestyle. Performing our duties well will inevitably follow."